At first glance, it could be a number of modest houses jumbled together. Or thrusting prows of a small armada coming into port. But the roofing elements, like the folded wings of a bird, play with perspective and invite the eye to roam. At dusk, the Eagles Aerie home seems to float on water with the pond providing light. 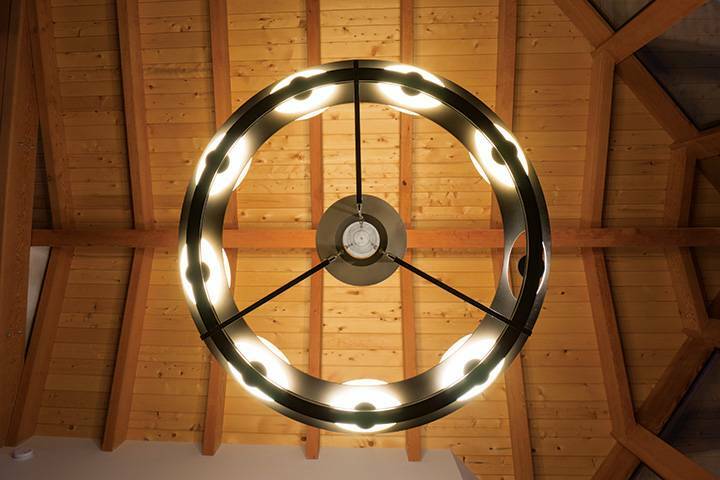 LED uplights the ceilings and downlights those big timber posts, creating shadow and accentuating the drama already in play with the thrusting angles of roofing. The key rooms are all corner rooms and each, framed with walls of glass and timber, engages two view aspects rather than just one. Light is caught from more than one side. And it is light and air, bringing indoors the surround of nature that the Eagles Aerie house is all about. 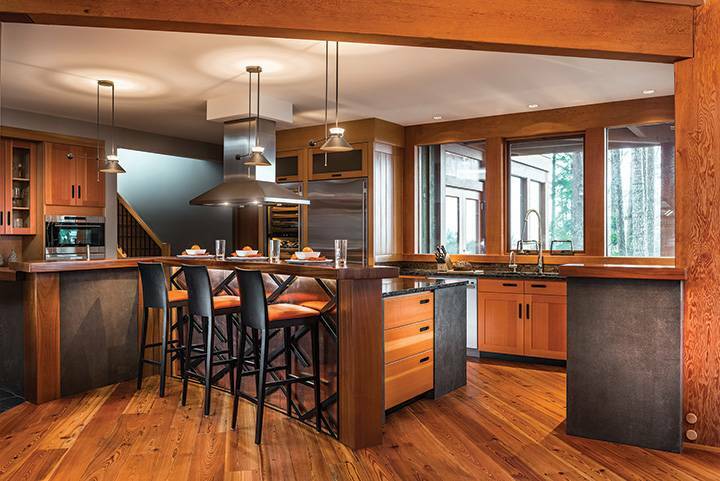 That’s exactly what the homeowner wanted with this brand new, custom, 4,135-square-foot timber-frame structure. Set in a forested acreage on a bluff above the Pacific, with unobstructed views of the close-enough-to-touch Coastal mountain range and the endless wash of the tides, this four-bedroom, six-bathroom eye-catcher is all about light and air — and bringing the natural splendour of the setting right into the rooms. Walls open to allow the outdoors in. Landscaping flows into the forest and down to the sea. 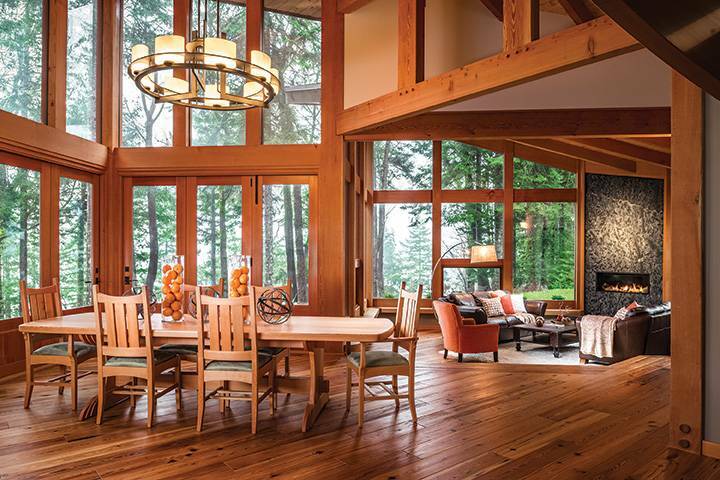 Wary of all that old growth Douglas fir in the interior, the owner was specific that he didn’t want a rustic, hunting-lodge feel. 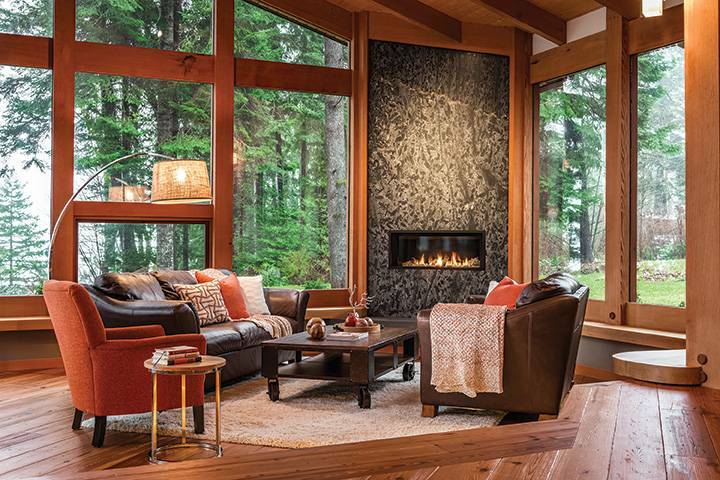 Instead, the cabin-y warmth of 350 timber beams is enhanced by the addition of 145 windows. 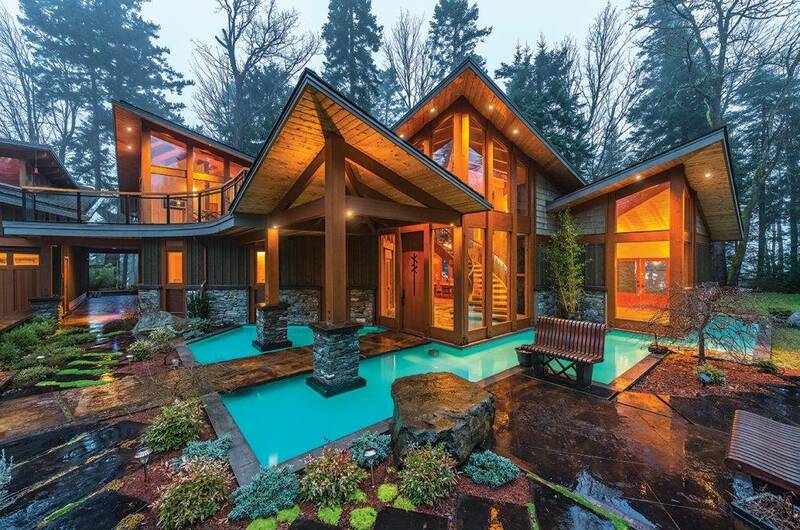 It’s truly West Coast modern with all the expected amenities: state-of-the-art media room, steam shower, infrared sauna, acid-stained concrete decking, in-floor heating, outdoor gas fireplace and a triple-bay garage with its own carriage house. 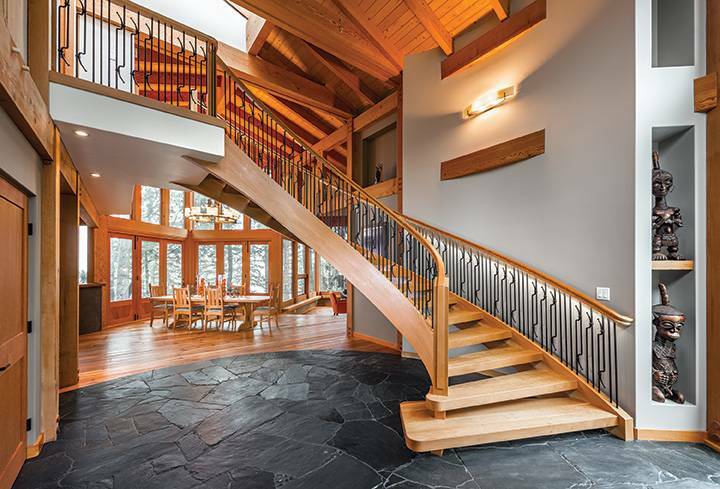 “It’s a showpiece that blends with the environment,” notes Carl Tessmann of Island Timber Frame, the local firm whose European craftsmanship is evident throughout. And meant to be there for a long, long time, assures Tessmann. 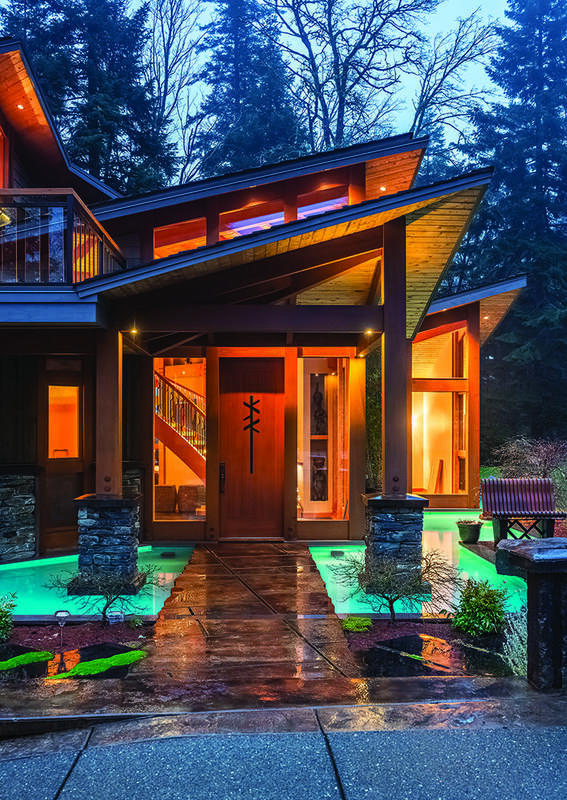 The guest wing of the house includes three bedrooms and an infrared sauna. The motif found in the railing at the top of the stairs is an architectural detail that can be found repeated throughout the house, from the front gate to the kitchen bar. 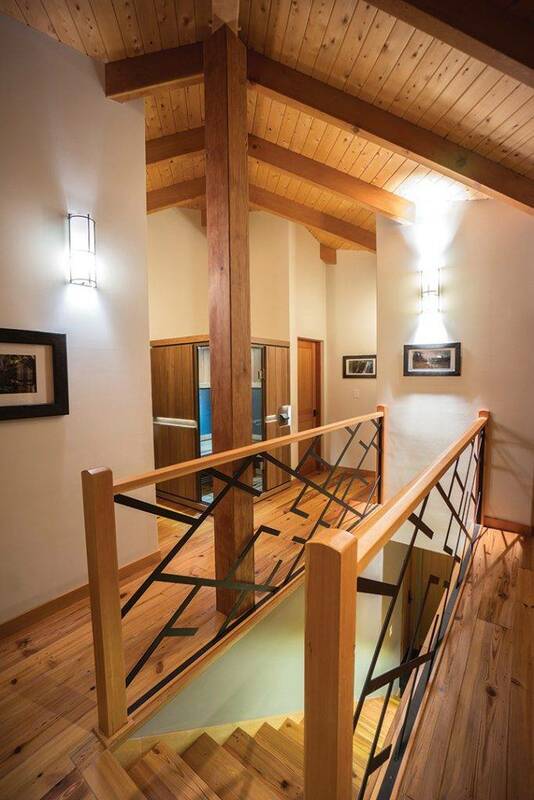 The alluring curve of the staircase, with its light cherry wood treads, floats like it defies gravity. The slightly wider landing onto heated flagstone flooring makes a welcoming approach from the kitchen. 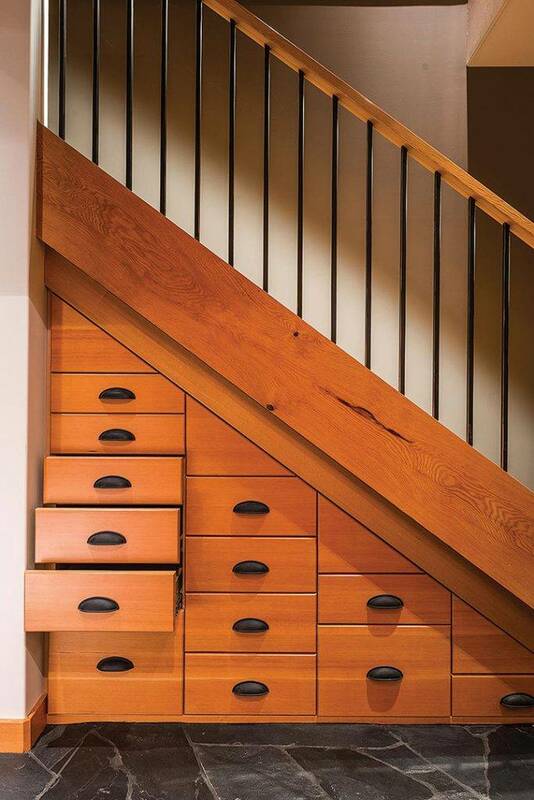 These under-stair drawers with rustic pulls are a clever and beautiful way to maximize the space. 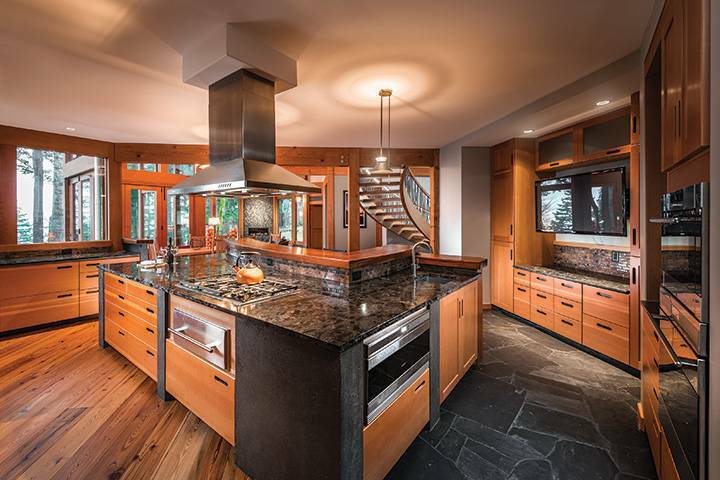 It’s a marriage of wood and stone in this kitchen featuring Brazilian hardwood and granite countertops. Discreetly nestled in all that kitchen storage space are Wolf appliances with comfort touches like a warming drawer under the gas range and a full-height wine cooler. 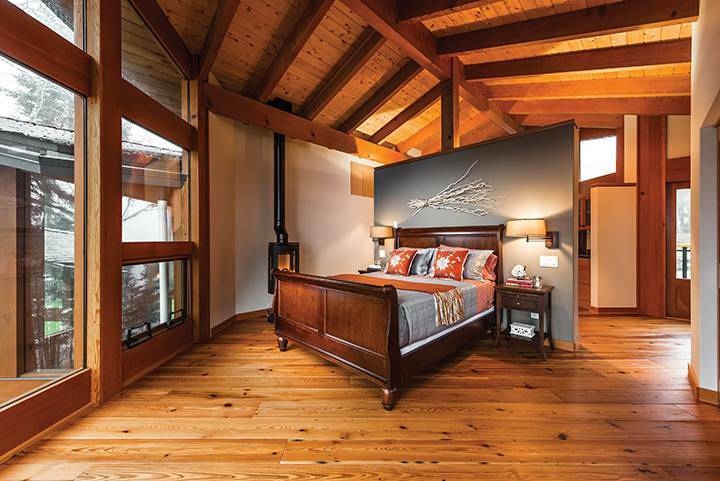 The levered windowed walls of the master bedroom, which is perched high above the forest canopy, open up completely to the outside, giving the sensation of sleeping in the trees. 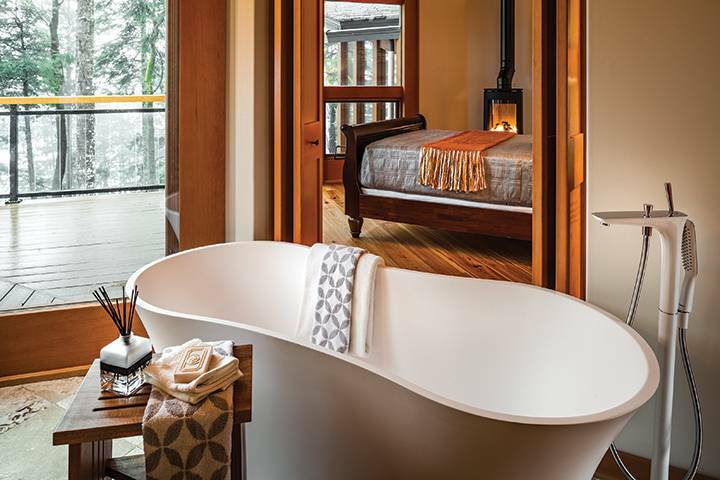 The open-concept room uses folding wooden doors to separate the master bath — the doors can be left open for a view of the fire from the bath or closed for privacy. 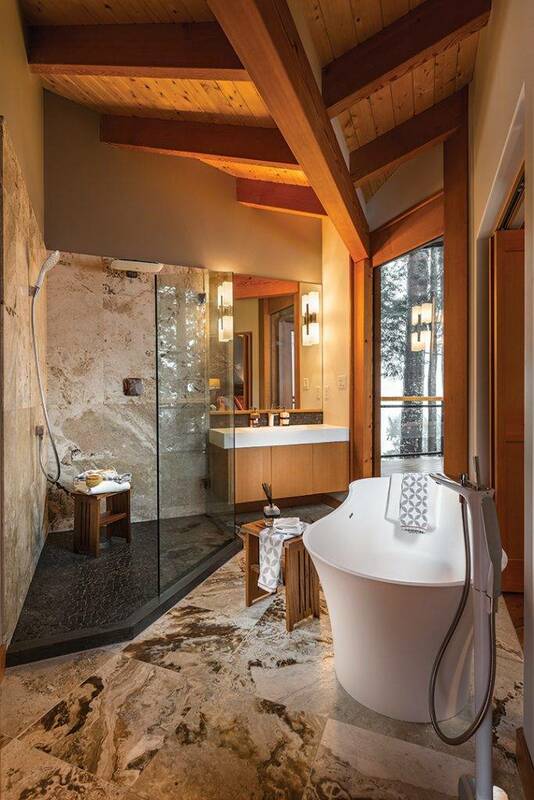 In the master bath, a 500-lb. natural stone bathtub (lifted into place by crane) is curved like a seashell you might find on the 400 feet of beach a few steps away. Fixtures throughout are by Hansgrohe. 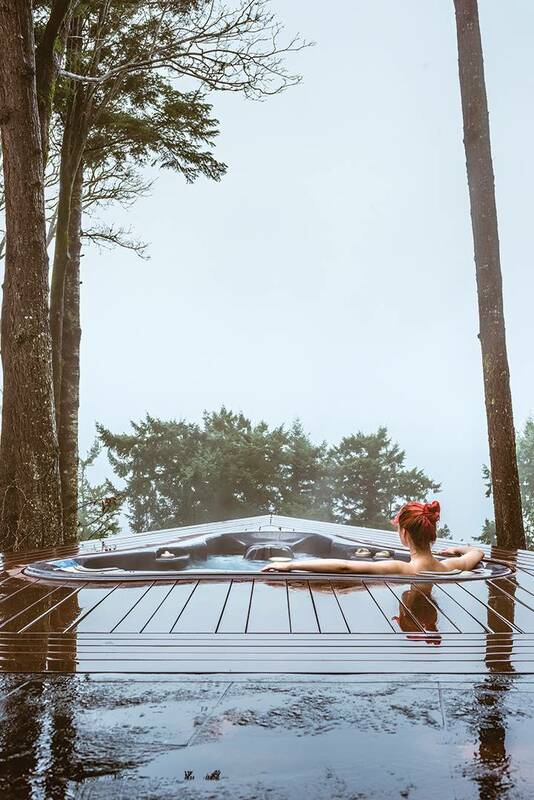 Under a star-filled night sky or enshrouded by mists creeping in from the ocean just below, the intimate hot tub looks out over the view from the steep, forested embankment. From there, it’s nothing but mountains, trees and waves.